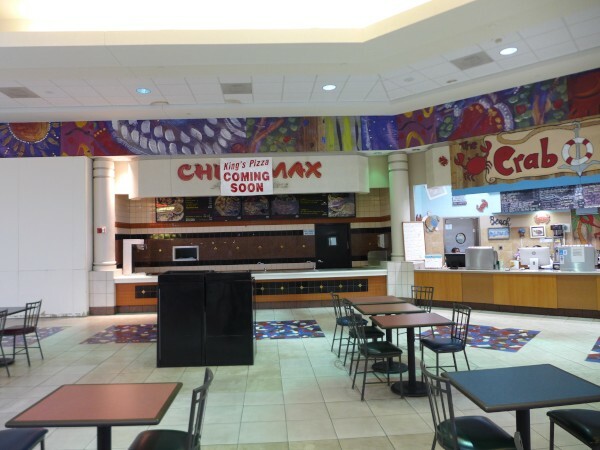 I noticed when I was in the Columbia Mall food court recently that China Max was closed. It's been quite a while since I was at the mall last, so I'm just tagging the date as 2018 for lack of anything more precise. I presume this China Max was connected with the China Max at Richland Mall, but I don't know for sure. What I find especially interesting is the sign proclaiming that the place will soon be a King's Pizza. This pizza chain seems to be making a big splash all of a sudden, with a store on Forest Drive in the former Charlie's Wings, one opening here, and one opening in the old Chickadee's Diner on Marshall Street. Subscribe to comments with RSS or TrackBack to 'China Max, Columbia Mall: 2018'. OK this has been informative because of the Kings Pizza thing. There's the exact same sign on the weird building in Triangle City (1125 Meeting St) that seems like an awful location for anything, much less food. Also I see the sign on the former Chickadee's from 277 but couldn't read it. Thanks for saving me the trip down there!